Forward-thinking climate action can be an economic boon, write President Felipe Calderón and President Ricardo Lagos in The Economist. The UN Climate Change Conference (COP21) in Paris is a vital chance to advance a new era of better growth. 24 members of the Global Commission on the Economy and Climate call for stronger climate action ahead of COP 21. 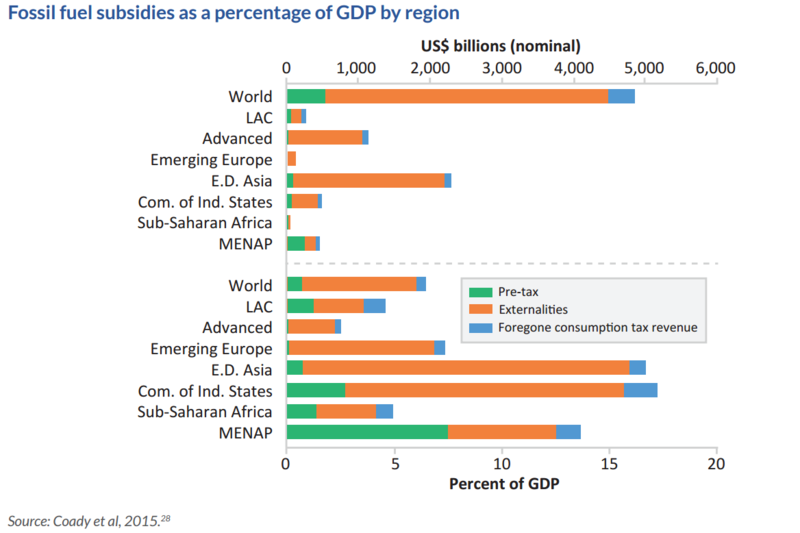 Fossil fuel subsidies take up a huge chunk of countries’ budgets and the world’s GDP. That leaves less money for other social and development objectives. Many developing countries spend far more on fossil fuel subsidies than they do on healthcare. A new paper by the New Climate Economy identifies the lessons learned from past attempts to reform fossil fuel subsidies, explores why progress has been slow, and outlines the principles for successful reform. New research from the New Climate Economy shows that raising energy efficiency standards in the G20 and around the world could reduce greenhouse gas emissions by up to 6.9 Gt CO2e per year by 2030, more than the current annual emissions of the United States. These emissions reductions would be accompanied by economic savings in appliances, buildings, industry, and transport. Victoria Falls, October 28, 2015: New research from the New Climate Economy outlines opportunities to transform and expand the supply of energy in Africa, spurring development and reducing negative health and environmental effects. The two papers on investment in the electric grid and clean cookstoves were launched today at the Climate Change and Development in Africa conference in Victoria Falls, Zimbabwe. 22 October 2015 – A new paper from the New Climate Economy recommends that Parties to the Montreal Protocol approve an amendment to phase down Hydrofluorocarbons (HFCs), a fast mitigation action that could avoid the equivalent of up to 200 billion tonnes of carbon dioxide by 2050, and up to 0.5°C of warming by the end of the century. By 2030, the HFC amendment could avoid 1.7 Gt CO2 equivalent of greenhouse gas emissions per year, more than the current annual emissions of Japan. We must set course to a low-carbon future if we are to avoid the immense risks of climate change, write Ángel Gurría, Sri Mulyani Indrawati and Lord Nicholas Stern in CNN. Today’s innovations also remind us that the best responses to climate change are those that address people’s daily needs, including, in the African urban context, creating the type of jobs that local unemployed people can fill, write Trevor Manuel and President Felipe Calderón in Project Syndicate. A new paper, Implementing effective carbon pricing, from the New Climate Economy shows that carbon pricing works and doesn’t harm the economy. It urges developed and emerging economies, with the G20 in the lead, to commit to introducing carbon prices of roughly comparable levels by 2020.